We now live in a digital society, depending on home computers, laptops, pads, and a variety of other mobile devices to keep us connected, but keeping those devices working efficiently means keeping them free of clutter. 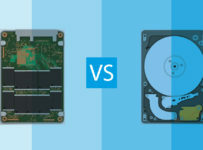 To that end, external hard drives offer a way to collect and keep content, software, and documents easily accessible without allowing them to take up valuable computer space. 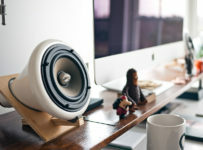 In addition to keeping this data available and stored in a safe place, external hard drives are versatile pieces of technology that can be plugged into any computer with a USB port. While the capacity of each drive may vary, the space allotted on the various hard drives has already made discs and diskettes as obsolete as the old style records and cassettes of the music industry. Making the external hard drive even more desirable is the ease with which they operate. Once plugged in and connected, Windows and Apple computers will readily read the addition of the drive, making it instantly accessible on the system. By storing software or content on an external hard drive, documents, software, and files can be made portable without the fear of damaging a disc. 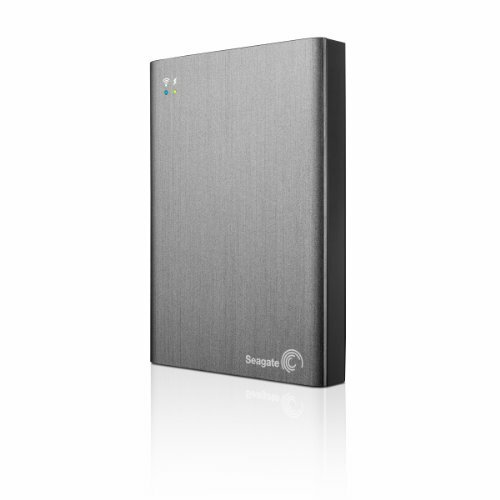 Below, we’ll look at the top five external hard drives offered by Seagate. This device is designed specifically for Windows 7 or Windows 8 operating systems and requires a SuperSpeed USB 3.0 port in order to benefit from its 3.0 transfer speeds. This device can also be used with USB 2.0 ports, but users should be aware that this will mean a slower 2.0 transfer speed rate. Additionally, this external hard drive offers a drag and drop feature, which allows the user to easily transfer files from the computer to the hard drive in a matter of seconds. Windows will instantly recognize the device, eliminating the need for additional software to be installed. There is also no need to reconfigure the computer to accept the external hard drive. Just plug it in and you’re ready to begin utilizing it. The 1TB size of this hard drive provides enough space for 1,000 hours of digital video, or 250 two-hour DVD films, or 320,000 digital photos, or 16,660 hours of digital music. Weighing just 6.4 ounces and a total dimensional size of 4.8 x 0.6 x 3.2 inches, this device is easily carried along in a pocket, suitcase, or backpack. This device comes in black or platinum to appeal to consumers with a preference for color options, as well as an interest in functionality. Unlike the previous device, this external hard drive is purposely designed as a back-up storage device. With that in mind, it does come with additional software for installing the Seagate Dashboard, which allows users to customize the interface more readily. There is no power cord with this external hard drive, but it does require USB 3.0 connectivity. It is also interchangeable between Windows and Mac operating systems without a need for any additional configuring. This external hard drive is unique in that it was also designed to be compatible with Playstation 4, though it does require the PS4 System Software Update 4.50 or higher. The dimensions for this device are 113.5 x 76 x 9.6 mm, weighing 5.3 ounces. The device comes with its own USB cord, ensuring it ‘s ready to be used as soon as it arrives. As the name of this product suggests, this is more than the average external hard drive, also coming with wifi connectivity. This allows users to stream content on the drive directly to any computer, tablet, or mobile device wirelessly. Additionally, it can also sync with both Dropbox and Google Drive, so you can access any file at any time. Taking the technology a step further, users can also stream three different movies to three different devices simultaneously. This external hard drive can also access multiple systems throughout the home, including DLNA devices, Samsung Smart TVs, and AirPlay. Used in conjunction with the free Seagate Media app, virtually any device can navigate the web or access content anywhere in the world, based on Wireless Plus plans offered by Seagate. This is one of those external hard drives that relies on a battery for power, but a full charge can last up to 10 hours. The required Lithium ion battery is included. This is a larger device, weighing a total of 9 ounces with 5 x 3.5 x 0.78 inch dimensions. 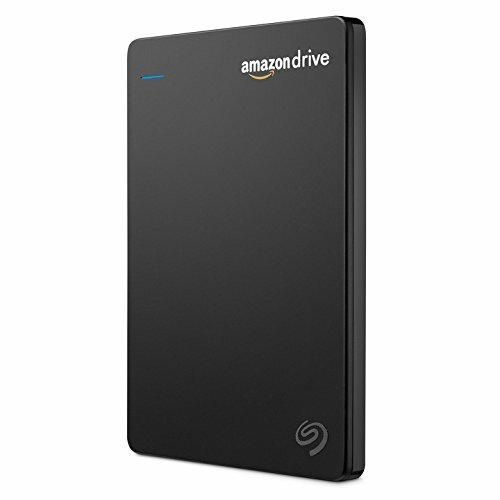 This external hard drive sets the user up with one year of free Amazon Drive service, so that already makes it an impressive package as either a back-up system or a primary storage device. This device is also easy to use with drag and drop technology. As the user drops files into the Seagate Duet window from either a Mac or PC device, the files are automatically synced with the associated Google Drive account, hence the name of this product. There’s also an Amazon mobile app that allows users to back up files from a smartphone or tablet instantly. The app also makes it convenient to access files from anywhere and deliver them to the device of your choosing. Uploading and downloading speeds may be affected by the limitations of the user’s internet service provider. The Seagate Duet Cloud-Syncing 1TB Portable External Hard Drive weighs just 4.34 ounces and measures 2.99 x 0.38 x 4.47 inches. 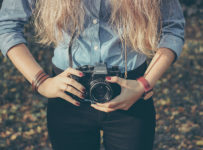 The availability of dual storage lets users feel confident that their files, whether important career-related documents or a collection of favorite films, will remain safe and accessible for years to come. This external hard drive won’t be easily misplaced, standing out with a bright red casing that’s built for durability and a style of its own. 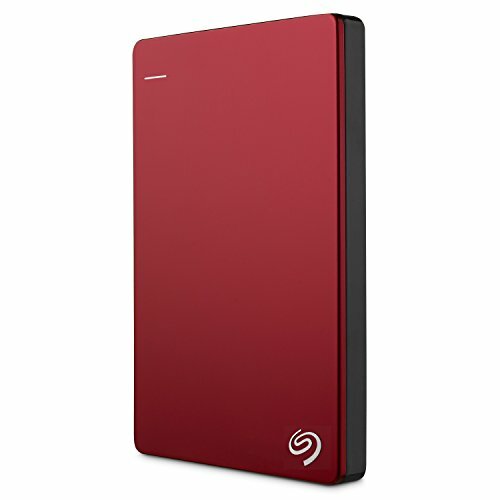 Aside from its bright red coloring, the device comes with the Seagate Dashboard, which provides a useful and customizable interface for the user. Additionally, the Seagate Backup Plus Slim 1TB Portable External Hard Drive only relies on the USB connection, meaning no additional power source is required. Again, this external hard drive is interchangeable between Mac and PC operating systems, making file transfers easily and fast. This system is also compatible with Playstation 4, making it the perfect gift for gamers, as well as social media trendsetters. Weighing 5.28 ounces, this external hard drive is another compact option with size dimensions of 2.99 x 4.47 x 0.48 inches. 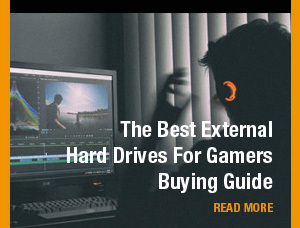 Like every item on this list, this external hard drive supports 1,000 gigabytes of data, which translates to 1,000 hours of video, 320,000 photos, or 16,660 hours of music. Whatever device you choose, know that you can feel secure having a additional storage space for your most important files. Not only does this free up memory on your computer, tablet, and mobile device, but it also ensures that a virus or computer crash won’t claim all of your content in one swift stroke.